The outstanding location of this privately situated condominium, just (0.4 mile) from the Historic Downtown Plaza, allows one to walk to the plaza in a few minutes passing three or four top restaurants along the route. Upon entering Adobe Brisa you see slabs of pine steps leading to the second, bright, airy, main floor. Treetop, sunset, and distant mountain views are enjoyed throughout the living area and the deck. The living room, dining room and spacious kitchen all flow together. Individual artists work throughout the condo compliment the vigas and latillas. Handmade dining chairs by Tim Hintz set the tone of comfort and uniqueness. Air conditioning welcomes you to a cool escape from the occasional hot summer days. The bright, cheerful, well-equipped kitchen has ample work space for preparation of a gourmet meal or a simple lunch sitting on stools around the kitchen table. The deck is accessible from the kitchen and offers a comfortable outside eating or a gathering area to watch the sunset. The living room has a flat-screened TV, comfortable seating and an extensive collection of books and games for your enjoyment. The master bedroom has windows on three sides providing excellent cross ventilation on cool evenings. Santa Fe nights are usually cool and delightful. The two widely separated bedrooms give privacy to two couples. The guest bedroom is located downstairs and has its own small patio. Beautiful hand-carved headboards grace the room. Each bedroom has a Mexican tiled bathroom with two sinks and a flat-screened, high definition TV. The attached garage allows comfortable access even during inclement weather. Parking can be difficult in downtown Santa Fe. We welcome you to be our guests. We have put much love and energy into this condo and look forward to sharing it with you. Thanks to the staff and owners for a beautiful and restful week. Todd Davis is extremely helpful and easy to deal with. This is the second time we've rented through him and we will definitely be back to book with him again! We stayed in this property for a few days in September 2012. 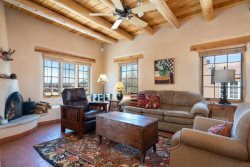 This charming Santa Fe style condo is only a short walk to the square with all its surrounding shops and great restaurants. All the amenities of home are provided for your convenience in this beautifully decorated condo. We will certainly be back with friends and family.